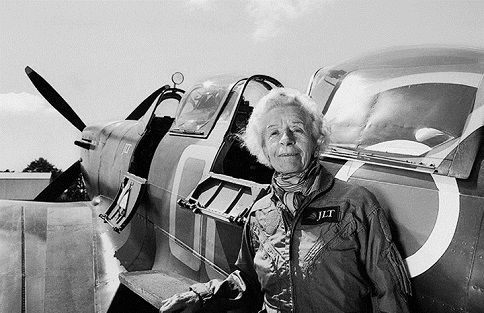 01/11/2013 "Pilots of the Caribbean"
Mary Ellis (née Wilkins), who died today aged 101, was the last surviving female Spitfire pilot - who flew 400 of the planes during the Second World War. She joined the ATA (Air Transport Auxiliary) in 1941, after hearing an advert for women pilots on the radio. By the end of the war, she had spent more than 1,100 hours flying 56 different types of aircraft. In November 2016, she and fellow ATA pilot Joy Lofthouse (1923-2017) were honoured in front of members of the Royal Family at the annual Festival of Remembrance at the Royal Albert Hall in London.